Marketers today are under intense pressure to prove the impact of their efforts on revenue and demonstrate ROI. 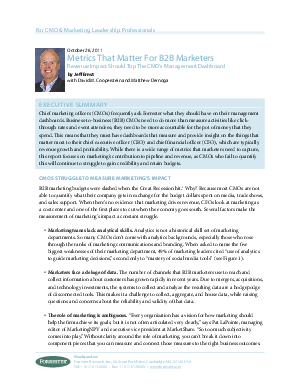 To succeed, they need to report on the metrics that matter most to executives. Download this Forrester report to find out what B2B marketers report as their team's biggest weaknesses and why many of the metrics that marketers are focused on, aren't the right ones.